Tonight's demo is on hinge benders. Both types are found in the book Professional Smithing by Donald Streeter, 1980. These are relatively standard. I've used both types. Couldn't find the parts of either. . must of canabalized them. A common thing to do since I'm down in the country. Often if you are short a piece you ah, "borrow" it from something else. 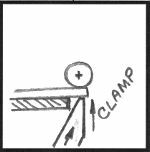 Figure 1 - Click for details This is a detail drawing of the lever type. Click to enlarge (when posted after demo). If you make these to handle thicker stock they will also work on thinner stock. However the pin size stays the same. The bending nose is best made of some sort of hardenable tool steel. 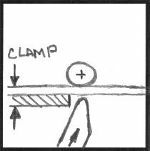 I differ from Streeter in that I make the stationary part from a piece of angle so it can be clamped in a vise. I am also using shims on one side of the bending nose rather than set screws on both sides. Remember that wide benders work on narrow hinges but no vise versa. Don't get carried away. There is a limit to what the pin can take. Bigger benders need to be made heavier too. There are several ways to use this type bender. Streeter clamps the bending nose tight on the stock and pin and lets the stock pull through the bender. 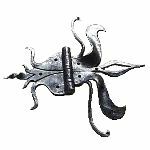 The other method is to feed extra stock through the bender and clamp it to the stationary arm. Then adjust the bending nose to a slip fit and pull it around. 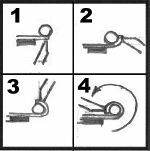 This method also works for ends that are pre-bent and prepared for welding. 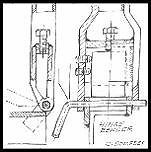 Figure 7 - Click for details Our second bender is used on an arbor press. This type is best used on thin material. It makes a wrap that goes as far as possible. I make these benders using a mandrel that can be used to push the bent hinge out of the bender. Click to enlarge. 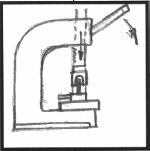 Figure 11 Stock can be prepreped with notches or cut later. If using a press to shear stock it is best done before hand. If hand sawing the stock you can fit the parts after bending. Figure 8 These benders work in any arbor press big enough to get them in. 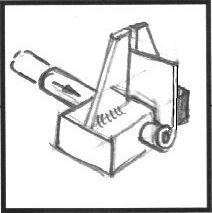 You can also use a vise or tap the pusher with a hammer. The arbor press does a better job. The pusher bridges the guide plates. After pushing the stock home the mandrel is used to push the finished part out. Figure 12 The finished bend by this method is clean and smooth with a complete wrap. What are the stock limits for each or the different units? 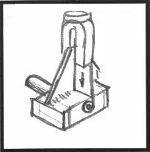 what is the thinnest iron you can use in the arbor press bender? good demo jock. never thought of using srbor press. would be hard on longer hinges though. 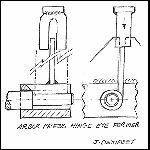 Arbor press version: Is the stock wrapped around the mandrel hot? For the lever type if they are made so that the stock size is smaller than the pin you can make them until you can't pull it by hand. Leah, I have pushed 0.050" stainless stock in one of these. No both of these are use COLD. On "how thin" this is the method that most "factory" made hinges are produced by. I suspect that .010" material is not a problem. 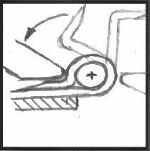 What becomes a problem at that thickness is making the slot in the die. My first pusher type was made using a hack saw anf then filing the slot with a fine file. My second one was made using a 1/16" cut-off tool in a shaper. It is also possible to make these by the multi piece method. I'll make a sketch to go with the details.